I am back in Sweden and am blogging from Gothenburg. There seems to be Swedish envy back in the USA with even an OpEd in The New York Times of a day ago by Thomas B. Edsall Why Can't America Be Sweden?, which notes the work of Daron Acemoglu of MIT. I have written several posts on a similar theme on this blog regarding the quality of life in Sweden as well as its great infrastructure. We had the pleasure of hosting Daron, as well as his wife, Asu Ozdaglar, also of MIT, in our UMass Amherst INFORMS Speakers Series. Now is the time of high school graduations in Sweden and the graduates are dressed up and wearing sailor caps. The photos below were taken in downtown Gothenburg today. And for photos from a recent high school graduation that my daughter attended, but in the US, since she graduated 1 year ago.from Deerfield Academy and several friends had returned to reconnect, you can click here. The weather was quite different (cold) this year from her graduation of a year ago! 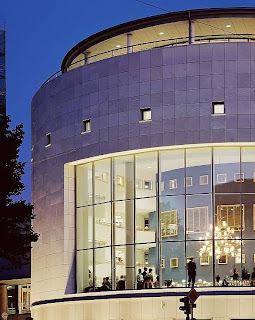 On June 12, 2013, I will be attending another graduation - that of those receiving the Master's degree from the School of Business, Economics and Law at the University of Gothenburg, where I will be delivering the commencement speech. I guess that they like me here, since I also delivered the commencement speech last year and the experience was fabulous. I am back in Sweden for less than 24 hours and am sitting in my office at the School of Business, Economics and Law on a beautiful, crisp Saturday morning. It is GREAT to be back and even the journey from Amherst to Boston Logan Airport and then on Delta to Amsterdam Schiphol, followed by KLM to Gothenburg, Sweden was wonderful! I was anxious since the weather forecast was not good - thunderstorms and high winds, and I met a gentleman at Logan, whose KLM flight the evening before had been cancelled. However, everything has to be kept in perspective, given the tornado disaster in Oklahoma, for example. Thanks to Delta for such great service, despite there not being a single empty seat on the flight. Thanks also for my great seat assignment --aisle seat - in the group of 4 rather than 2, as is usually my preference - but next to a female MD and PhD, who works at the Karolinska Institute in Stockholm. She was doing (and returning from) conducting collaborative research with a Harvard professor on autoimmune diseases and had also had a job interview at NYU. Her mother is a Full Professor of Medical Science at Karolinska so we talked about being females conducting research, the curiosity and passion that drives us, being part of a team, and even challenges (still) faced by female scientists today. She is presently on the interview circuit for a postdoc and I wish her well. She has 3 interviews at Oxford University this week with different research groups. After landing, and being driven to my new apt., which is close to Chalmers University, with a gorgeous view of flowering trees and a pond, a shower and a short nap, I walked for miles, retracing a few of my favorite haunts in this second largest city in Sweden, which I have grown to love and which has become my second home. I picked up the Friday issue of The Global Edition of The New York Times (The International Herald Tribune), and, while having a meal at my favorite Indian restaurant here, read the OpEd by Professor Gary Gutting of the University of Notre Dame. College education is a proliferation of such possibilities (new possibilities for intellectual and aesthetic fulfillment): the beauty of mathematical discovery, the thrill of scientific understanding, the fascination of historical narrative, the mystery of theological speculation. We should judge teaching not by the amount of knowledge it passes on, but by the enduring excitement it generates. Knowledge, when it comes, is a later arrival, flaring up, when the time is right, from the sparks good teachers have implanted in their students' souls. The fruits of college teaching should be measured not by tests but by the popularity of museums, classical concerts, art film houses and book discussions, and publications like Scientific American, the New York Review of Books, The Economist and The Atlantic, to cite just a few. These are the places where our students reap benefits of their education. Coincidentally, for my flights, I had packed up not only a New York Times but also (saved up) two issues of The Economist, one of which I shared with my traveling companion, Dr. Dr. Susanna of Stockholm (since she has an MD and a PhD I believe the Dr. Dr. is merited.). She was very grateful, since she had been working so hard at Harvard that she had not packed up any reading material. And, yesterday, while doing a quick check of my email I found out from one of my doctoral students, Dong "Michelle" Li, that our latest paper, which we had revised just prior to my departure for Sweden,. 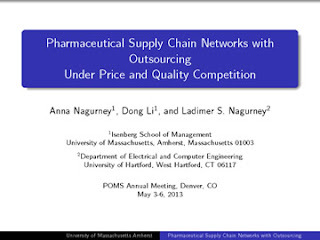 "Pharmaceutical Supply Chain Networks with Outsourcing Under Price and Quality Competition," was accepted in the International Transactions in Operational Research. I could feel her excitement across the miles in the email message. I also received a message from a former undergraduate student, who had majored at the Isenberg School of Management in Operations Management, and who was a huge fan of our UMass Amherstr INFORMS Speakers Series, which I supported for 14 semesters. He is now interested in applying for an MBA and is looking into online programs since he is a full-time employee. It is the continual intellectual curiosity and sense of wonder of the world around us and discovering new ways of seeing and thinking, as Professor Gutting so eloquently stated, that are what makes for an education as well as good employees. Yes, technical knowledge learned in school and maintained and developed through use in our chosen professions, including business, engineering, medicine, and others, is essential but true creativity, whether in the humanities or in scientific discoveries or business innovations, comes from questioning assumptions, and challenging existing dogma. And, when they do happen, there is a distinctive pleasure of intellectual understanding and satisfaction attained. Thanks, Professor Gutting, for sparking the conversation surrounding why we teach. And, although I am on sabbatical this year, I have still managed to contribute to teaching here in Sweden, on Operations Management and Supply Chain Network Theory, in Austria by teaching a course at the Vienna University of Economics and Business on Humanitarian Logistics and Healthcare, and next week I will be taking part in a PhD Workshop on How to Publish. My doctoral students (present, past, and, hopefully, future ones) in Management Science will continue to educate others and to inspire and this gives me great satisfaction. Now is the time for college graduations and, in Massachusetts, over the past several days, we have been the scene for numerous ones -- from the UMass Amherst graduations to graduations in Boston and to even the Smith College graduation last weekend at which Arianna Huffington gave the commencement address. And Oprah Winfrey will be speaking at Harvard University's commencement on May 30. Last, year, I was honored to give the commencement address at the Master's degree graduate commencement ceremony at the University of Gothenburg's School of Business, Economics and Law on June 14, 2013. 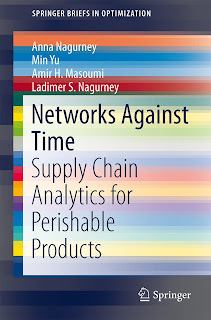 My speech was on Life as a Network and it can be accessed here. A writeup on the speech appeared in the UMass Amherst's In the Loop. When I received an invitation a few months ago from Dean Maureen McKelvey of the University of Gothenburg to give this year's commencement speech, I immediately agreed. Giving a commencement speech in the US is one thing -- giving a commencement speech in another country is a truly special experience. I had the great experience of giving the commencement speech at the Isenberg School's undergraduate commencement in May 2003, which took place at the Mullins Center, so I can say that I have given such speeches on 2 continents. 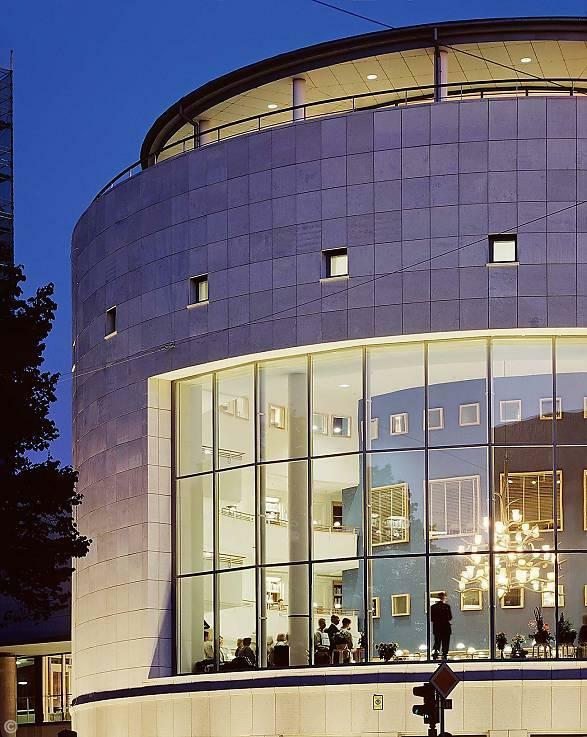 This will be my fifth visit/stay in Gothenburg, since 2012, and, as a Visiting Professor of Operations Management there, through its unique Visiting Professorship Programme, Gothenburg, Sweden has become my second home. I will be delivering my commencement speech on June 12, 2013 in Gothenburg and my theme this year will be Leadership. I will speak on what makes a great leader -- one of many themes that I have been writing about on this blog and will also bring personal experiences into the text. I plan on emphasizing resiliency, creativity, communications, diversity, and integrity, and, as I did last year, I will share with you photos from the ceremony. Today, we had our Isenberg School of Management PhD picnic in North Amherst on a cool and rainy Sunday afternoon. I always feel that it is very important to show up to such events to support the doctoral students and, despite the weather, it was wonderful to see many of our students enjoying one another's company, conversing with the faculty who showed up (a few actually did), and huddling in the pavilion for some warmth. This was a nice break, despite the unfortunate weather, since I had spent hours working on a plenary talk, Network Economics and the Internet, that I will be giving in Athens next month. I had been "in the flow" for hours, consumed by the task at hand and had made great progress -- quite enjoyable and rewarding. I have written about working in industry as a computer programmer, while pursuing my Master's degree at Brown University in Applied Math (thanks to the companies that paid my way). and often write about how much I enjoy the research that I do, which necessarily requires algorithm development and implementation -- which means computer programming -- to solve problems that we build mathematical models for. Computer programmers are necessarily resilient! Ullman writes of the challenges that she faced during 20 years as a programmer and how today women may be facing even more virulent discrimination and prejudice and the numbers reflect that women are underrepresented in the computer science fields and industry. She speaks of venture capitalists looking for those that resemble them to invest in. Sad to say, I feel this prejudice even as a holder of a chaired professorship. Ullman speaks of the disregard and the invisibility and I can attest (colleagues can confirm) that requests for information at even a departmental level fall on deaf ears and no response is received, despite repeated attempts. What will save you is tacking into the love of the work, into the desire that brought you there in the first place. This creates a suspension of time, opens a spacious room of your own in which you can walk around and consider your response. Staring prejudice in the face imposes a cruel discipline: to structure your anger, to achieve a certain dignity, an angry dignity. Indeed, all we can do is to lose ourselves in our work and maybe that is what instills the strange responses, whether of silence or of disregard -- we can and will continue to lose ourselves in research that we truly believe in. And with 3 female doctoral students, I have to serve as a role model. I have been busy preparing a series of presentations that I will be giving soon in Europe. The first one I will deliver on June 3, 2013 at the School of Business, Economics and Law at the University of Gothenburg in Sweden. My presentation is entitled: Reflections of an Experienced Researcher on Presenting and Publishing Quantitative Research, and it is one of several presentations that will be given at the Nordlog Doctoral Workshop as part of the 25th NOFOMA Conference, Gothenburg, Sweden. Professor Patrik Jonsson, Chalmers University of Technology. Some Background Where Do Research Ideas Come From? What is Your Philosophy of Research? What About Writing a Publishable Paper? 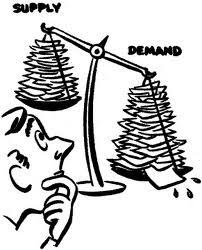 In my presentation, I will also discuss some of the competitive challenges associated with journal publishing from the point of journal article supply and demand (and hope) of authors for publication. I will also provide strategies for journal selection, revising a paper, etc., and emphasize that one should never give up hope if you believe in your work and to keep at it. This was a topic of a previous post of mine -- thanks to all of you who wrote me that you very much appreciated this blogpost. 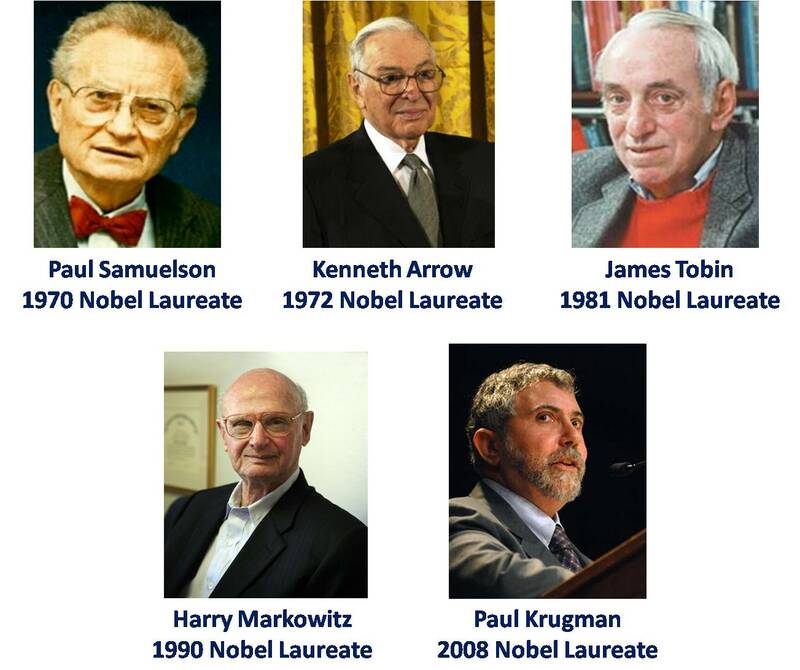 The montage below has photos of several Nobel laureates in Economic Sciences who had their papers rejected and some of the very same papers, after they were eventually published, became classics. And there are others with the same experiences! Of the above laureates, I had met Paul Samuelson when I was at MIT as a Visiting Professor and Scholar over a 2 year period and I met Harry Markowitz in an elevator at an INFORMS Conference. Kenneth Arrow I had met at a workshop at Stanford University at which my dissertation advisor, Stella Dafermos, also took part. As for Paul Krugman, I enjoy his writings, including his OpEds in The New York Times and our points of additional intersections include that he is an RSAI Fellow, and so am I. The PhD Workshop should be very interesting and fun, since we are even instructed to bring swimsuits and a towel for a sauna event in the evening! I was (very) pleasantly surprised and pleased when the Editor of a journal in Operations Research recently approached me to suggest names of female researchers who might be added to the editorial board as Associate Editors since the volume of submissions to the journal was growing dramatically. The Editor wrote me since he knows that I care about (and try to act accordingly) promoting the visibility of female researchers and this is clearly a substantive way in which visibility and reputation can both be increased. This got me to thinking about being an Advocate vs. a Mentor, a topic that has been receiving a lot of attention in corporations and, also, in scientific and academic circles, but which needs more. According to this report, which cites several Harvard Business School publications, the hallmark of an Advocate (sometimes referred to as a Sponsor), is the inherent public nature in that advocates "stick their necks out" and, while a lot of mentoring can be done behind the scenes, advocates put their names next to your performance and make their support highly visible. Hence, your advocate should promote your visibility, advocate for your next promotion, make connections for you with senior leaders, and connect you with career opportunities. Of course, an advocate, is still a mentor, and can offer career advice. One mentor is not enough; in addition to mentors, cultivate sponsors – senior people of influence who will promote your ideas and support your career through nominations to key symposia, society awards, and the like. I also believe that administrators could and should be Advocates but, sometimes, and this may be due to academic politics, may try to just "work behind the scenes" whereas sending out an announcement to faculty and upper level administrators commending someone on a great accomplishment would create not only good will but would also extend the communications outreach. Some administrators acknowledge and advocate whereas others may have their own agendas. However, when faculty (and students) achieve the entire enterprise gains. Academics need to feel "connected" to their schools and universities and professional societies and without advocates they may just seek acknowledgment elsewhere. Have them be part of a Speakers Program -- I chaired the INFORMS Speakers Program and one of the best things that we did, I think, was not only to increase the geographic representation but also the diversity. If you are organizing a conference, have at least one female plenary speaker (just recently, I received a notice for a conference with about 8 male plenary speakers and not a single female -- no chance that I'll be going there nor will I send any of my doctoral students). Nominate females for professional recognitions -- from students to senior colleagues. Invite female researchers to speak at your campuses. Share the news about the successes of the accomplishments of females in newsletters, media, press releases, etc. Nominate females for professional society offices. Appoint females to editorial boards. And, when someone achieves, send a congratulatory note (I try to do this for all my colleagues, male or female)! It is a truly gorgeous May day -- simply perfect for the UMass Amherst graduations! This morning we took part in the Graduate Commencement ceremonies at the Mullins Center since my doctoral student, Amir H. Masoumi, who successfully defended his PhD dissertation this past February, was receiving his PhD with a concentration in Management Science from the Isenberg School of Management. The pageantry from the music to the banners and flowers to the faculty and administrators in their caps and gowns along with those receiving their Master's and PhD degrees was perfect. This year something very special was done and I hope that it becomes part of the UMass Amherst tradition -- the dissertation advisors got to "hood" their PhD students who were receiving their degrees. I lucked out since we ended up being seated in the first row just behind the musicians so Amir Masoumi was one of the first to go on stage. His wife, Azitha, received her Master's in Engineering, so the day was one in which to celebrate. Our Chancellor, Dr. Kumble Subbaswamy, gave a warm and inspiring speech and we were surrounded by great feelings of accomplishment and what can be achieved through hard work. The photos were taken this morning both at the Mullins Center and then outside -- the reception that followed had everything from yummy croissants to fresh fruit and small muffins to delicious coffee! Congratulations to all the graduate degree recipients and this afternoon we celebrate the thousands who will be receiving their undergraduate degrees from UMass Amherst. Thanks to all the staff members who made the ceremony flow so smoothly and efficiently. Who is not fascinated by paradoxes! As a researcher and educator in networks, I have done a lot of work on the Braess paradox, and even had the honor of translating, along with him and Tina Wakolbinger, the classic 1968 article by Braess (from German to English). Tina, at that time was my doctoral student (and is now a Full Professor). 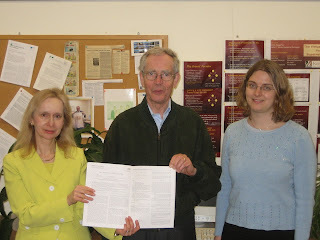 Below is a photo of the three of us taken in my Supernetworks Lab in 2006 at the Isenberg School at UMass Amherst, after our translation was published in 2005 in Transportation Science. Professor Braess traveled from Germany to visit us. That year I was on sabbatical as a Science Fellow at the Radcliffe Institute for Advanced Studies at Harvard. This intriguing paradox, which shows that how humans interact with infrastructure (transportation in the original version), matters in that the addition of a new road/route may make travelers all worse off in terms of an increase in travel time (under user-optimizing behavior). I have spoken on this paradox and examples in the real world at the World Science Festival in NYC (great fun), and was interviewed on the topic for the PBS America Revealed video on gridlock by the winner of Survivor (2006), Yul Kwon (tons of fun). I have also written invited OpEds on the topic, including one for Resources for the Future. Recently, I had the honor of being a panelist on Traffic and Transport at The New York Times Energy for Tomorrow conference with the theme of Building Sustainable Cities (a true intellectual feast with great panelists and discussions that continue to this day in blogs and through emails and phone conversations). Some quotes were captured in this nice post from the IEEE Spectrum EnergyWise blog (thanks)! Joe Nocera of The New York Times, who needs no introduction, was our panel moderator and I noted transport policies, dating to ancient Roman times, the Braess paradox, and also highlighted the importance of freight to cities' sustainability. I mentioned my experiences of living in Gothenburg, Sweden, as a Visiting Professor, and the discovery there by a doctoral student, Niklas Arvidsson, of the milk run load paradox. Today, I heard from Niklas, who shared with me that his paper was published in Transportation Research A and he provided me with a reprint. 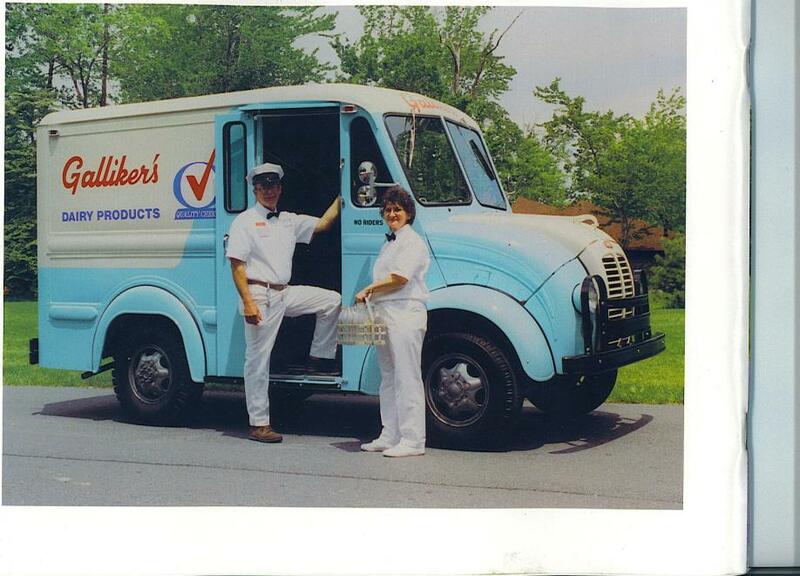 The paper, "The milk run revisited: A load factor paradox with economic and environmental implications for urban freight transport," shows that how you route a truck on a milk run (think of sequential deliveries as a milk truck would do in a bygone era) matters environmentally. Certain governmental policies internationally have focused on increasing throughput of freight but actually having a higher load over a longer distance may add to the environmental emissions so, contrary to certain policies, it may be better to take the route where you can offload your cargo (milk) as soon as possible. Today I also received a copy of Niklas Arvidsson's dissertation from the School of Business, Economics and Law at the University of Gothenburg. His supervisor is Professor Johan Woxenius and I am the co-supervisor. It is such an honor to be visiting this great group of researchers in transport and logistics who also have terrific practical insights. Research discoveries illuminate and intrigue and make you stop and think -- Wow! congrats to Mr. Arvidsson on such an important and exciting result and on the publication of his paper in Transportation Research A! I'll be back in Sweden soon for the defense and to celebrate. And, coincidentally, paradoxes must be "in the air," since my fellow INFORMS member and WORMS President, Professor Laura McLay, just today posted on the Braess paradox -- thanks for the acknowledgment. This has been a very eventful semester! As we begin to wrap up a great academic year (and although I am on sabbatical) I thought it appropriate to share news even before our next Supernetwork Sentinel newsletter comes out. Now, some of the latest highlights from the Virtual Center for Supernetworks at the Isenberg School of Management and its Center Associates. Professor Jose M. Cruz, who received 5 degrees from UMass Amherst, including his PhD in 2004 from the Isenberg School with a concentration in Management Science, is the recipient of the 2013 UConn School of Business Graduate Teaching Award. In addition, he will be the Director of the UConn M.S. in Business Analytics and Project Management for the next two years and continues as an Ackerman Scholar until 2014. Professor Cruz in 2010 received the Undergraduate Teaching Award from UConn's School of Business. We hosted him in our UMass Amherst INFORMS Student Chapter Speaker Series last December and his talk on how to get a tenure-track job and then get tenure was brilliant. When he shared the above great news with me he noted how much his education at UMass Amherst has helped him in his success (and as his PhD dissertation advisor, I could not be prouder). Amir H. Masoumi will be receiving his PhD this coming Friday in Graduate Ceremonies at UMass Amherst, an event I am very much looking forward to, since now the advisor will be hooding the PhD recipient. This event will take place at the grand Mullins Center in the morning. Amir had requests for over a dozen on campus interviews when he was on the job market this past year and will be assuming a tenure-track faculty position at the School of Business at Manhattan College. 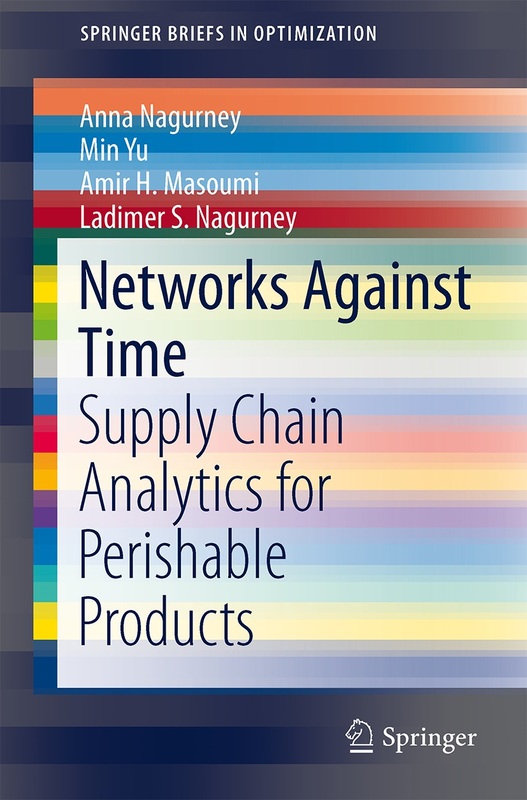 He, together with Professor Min Yu, who graduated with her PhD last year (I was also her advisor), Professor Ladimer S. Nagurney of the University of Hartford, and me, had our book, Networks Against Time: Supply Chain Analytics for Perishable Products, published in 2013. This was a great supernetwork team effort! Also, the special issue of Computational Management Science on Financial Networks, which I guest edited, is now in production. It will be a double issue consisting of 8 papers and I am so grateful to the authors (and the anonymous reviewers) for assistance in this big effort. My editorial, which discusses the papers in this special issue, can be accessed and read here. Professor Dmytro Matsypura of the School of Business at the University of Sydney has been granted a sabbatical and will be visiting the University of Pittsburgh for two months. He, along with several other Center Associates, including Professor Tina Wakolbinger of the Vienna University of Economics and Business, will be presenting research at the Euro-INFORMS Conference in Rome, Italy this summer. Professor Wakolbinger spoke in our series this past February, after the AAAS Dynamics of Disasters Symposium in Boston with other OR/MS and Engineering luminaries such as Professors Laura McLay, Panos M. Pardalos, David McLaughlin, and Jose Holguin-Veras. And speaking of conferences, I wrote about the wonderful Computational Management Science Conference in Montreal that I recently returned from, which overlapped by a day with the POMS Conference in Denver. My doctoral student, Dong "Michelle" Li did a great job presenting our latest work on medical nuclear supply chains and pharmaceutical supply chains with outsourcing there. Michelle Li with Center Associate Professor Patrick Qiang of Penn State Malvern at POMS in Denver and with two other doctoral students in Management Science from the Isenberg School in first photo below. Michelle with Professor Dayo Shittu, UMass Amherst PhD in Industrial Engineering, who is now a Professor at Tulane University at POMS in photo above. Our work on our big multi-institution, collaborative NSF project: Network Innovation Through Choice continues and our paper, The Cyber-Physical Marketplace: A Framework for Large-Scale Horizontal Integration in Distributed Cyber-Physical Systems,Tilman Wolf, Michael Zink, and Anna Nagurney, will kick-off The Third International Workshop on Cyber-Physical Networking Systems, in Philadelphia, in July. And, speaking of graduations -- what a happy time of the year this is for the graduates, their proud family members, and professors. I will be back at the School of Business, Economics and Law at the University of Gothenburg in Sweden soon, as part of my sabbatical this year, and will be giving (for the second year in a row) the graduate commencement address there. The next day, I will fly to Athens, Greece to give a plenary on our NSF project at the Network Models in Economics and Finance conference. No two days for an academic are ever alike and this is one aspect of the academic life that makes it an honor and truly special. Academics have such tough choices to make -- which conference to go to, which conference to present at, and which conference to, perhaps, send a collaborator to present, instead. Have you ever noticed how sometimes the most interesting conferences (or even events) happen at the same time or so close together that it may be hard to be present at both? I returned yesterday from the Computational Management Science (CMS) conference in Montreal and wrote several posts on it, with the latest one including photos. 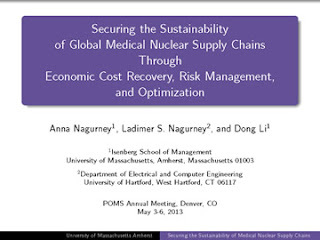 The CMS conference took place May 1-3, 2013, and, as luck would have it (I was on the steering committee), I presented a paper both in the first session on the first day and in the last session on the last day. May 3 was also the first day of the Mile High Conference taking place in Denver, Colorado, and organized by the Production and Operations Management (POM) Society. 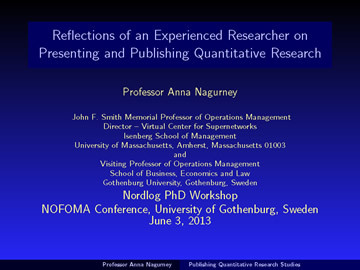 This conference ends May 6, 2013. I have two papers also at this conference and it would have been very difficult to make the first one, which was schedule for May 4, and the second one is to take place tomorrow, May 6. So, the solution -- one of my doctoral students, Dong "Michelle" Li, who is in Management Science at the Isenberg School of Management, is presenting both of our papers. Links to the full presentations are available here and here. The first paper above has been accepted for publication in a special issue of the International Journal of Sustainable Transportation. I made it back from Montreal via Air Canada and for a while there I thought that I would be the only passenger on the flight on the 18 seater airplane. Then 3 other passengers arrived (after the gate change was announced). I wrote two blogposts about the 10th Computational Management Science Conference , which took place May 1-3, 2013 in Montreal, Canada. The first post was about Professor Yingyu Ye's plenary talk and reminiscences about Professor George Dantzig and the second one was on the hot topics at the conference. Below I share with you some photos that I took at the conference. The conference was fabulous and I think the photos below capture some of the presentation highlights, social events, and venue. Many thanks to the organizers and especially to Professor Georges Zaccour, for such a pleasant and rewarding conference. This is the third day of the Computational Management Science Conference, which is taking place in Montreal, Canada. The weather has been warm and the sun is shining. The talks have been great and we have been treated to 3 outstanding plenaries (I blogged about Dr. Yinyu Ye of Stanford University and his presentation in my previous post.). Yesterday, Professor von Stengel of the London School of Economics spoke about the Game Theory Explorer and aplications and today we were treated to Professor Michele Breton of GERAD and HEC (the venue for the conference) and highlights of her research with her PhD students on recursive methods for pricing financial derivatives. This is my kind of conference -- wonderful lunches, coffee breaks, great discussions, with about 130 participants, very international, and, as is fairly typical for CMS, a female plenary speaker. I admit I gave one of the plenary talks at CMS in Vienna and was not even the only female plenary speaker at that conference. The methodological sessions have included sessions on stochastic programming, dynamic games (and applications), robust optimization, and more. I have very much enjoyed the energy application sessions which featured, among others, Professor Steve Gabriel of the U. of Maryland and Professor Warren Powell of Princeton, who noted that energy practitioners with whom he works call the delivery of electric power as `trucking`and putting electrons on wheels. This reminded me of the classic book by Beckmann, McGuire, and Winsten, Studies in the Economics of Transportation, in which they hypothesized that electric power generation and distribution networks behave like congested urban transportation networks. We have done research on the commonalities and have exploited these to formulate and solve the electric power supply chain for New England in a paper co-authored with Dr. Zugang Liu, which was published in Naval Research Logistics in 2009. Gabriel spoke on his model for the global gas market. He mentioned Ukraine several times and, since that is my heritage, he had me at the edge of my seat. I also enjoyed energy talks by Professor David Fuller from the University of Waterloo, where I have spoken at on several occasions, and several speakers at our CMS conference talked about game theory models and complementarity approaches. I spoke on Wednesday about our big NSF project on the Future Internet Architecture, which we call Choicenet, and on specific network economics and game theory modeling work that I did with Professor Tilman Wolf of UMass Amherst using variational inequality theory. My talk was in the first session of the conference, after the first plenary tallk, and I am also speaking in the last session today on our work with Professor Min Yu on time-based competition. Yesterday, we had the editorial board meeting for the journal (of the same name as the conference), Computational Management Science, and it was great to hear of special issues that are coming out and are being planned. Professor Berc Rustem, of Imperial College, led the lunch board meeting and it was great to see many of our colleagues, including Professor Georg Pflug from Vienna, Austria, and Professor Daniel Kuhn of Imperial College. My special issue on Financial Networks, which is a double issue, should be out within the next 3 months, I am told, which is very exciting. Of course, there are also sessions on transportation and on vehicle routing since colleagues here in Canada have been long-time contributors to these application domains. No need to even mention the names of Professors Gilbert Laporte, Patrice Marcotte, and Michel Gendcreau, but I am and it was wonderful to see them all here in Montreal. The finance sessions have also been great! Thanks to the organizers for putting on such a rewarding conference intellectually, personally, socially, and professionally. Kudos to Professor Georges Zaccour who has worked tirelessly to make this conference a big success! And for those of you who are interested, the CMS conference will be in Portugal next year. Last week I was in NYC, taking part in The New York Times Energy for Tomorrow Conference, which was fabulous. This week I am in Montreal, at the 10th Computational Management Science conference which began today with a brilliant plenary lecture by Professor Yinyu Ye of Stanford University. Professor Ye spoke about the simplex method and linear programming and also displayed several photos of Professor George Dantzig, the founder of our field of operations research, who was also his dissertation advisor. Professor Ye wove together the simplex method, Markovian decision processes, network flow problems, and generalized networks in a lecture filled with clarity and emphasized the criticality of theory (and, of course, application). What truly touched me was how he spoke of Dantzig, even including a photo taken of him at his 90th birthday party, and that he even as he was dying regretted not being award a Nobel Prize in Economic Sciences (as Kantorovich had). His discovery of the simplex method in 1947, including the pivot rule, has performed so well in practice and is even being used by hedge fund managers in finance today. He said that he wished that Dantzig was still alive so that he could share with him the recent theoretical discoveries regarding the simplex method and its performance in practice. After his presentation, I ran down the stairs to congratulate him and told him how much Dantzig had meant to me. As with all great individuals that one loves and reveres, you remember the moment that you heard of his or her passing. I will never forget the kindness that George bestowed on me by attending the first talk that I ever gave at an international conference (and it was a Mathematical Programming Symposium) at MIT in Cambridge. I treasure the photo that I had taken of him with me at an INFORMS conference in San Francisco and I show it to my students whenever I teach Linear Programming. 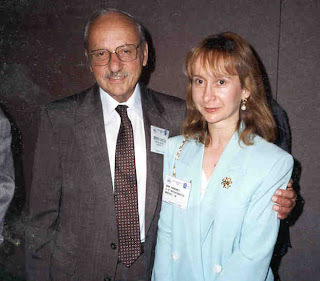 Ye and I ended our conversation by saying that George Dantzig was (and is) our hero. And, like his advisor a long time ago, Professor Yingu Ye came to my presentation today.